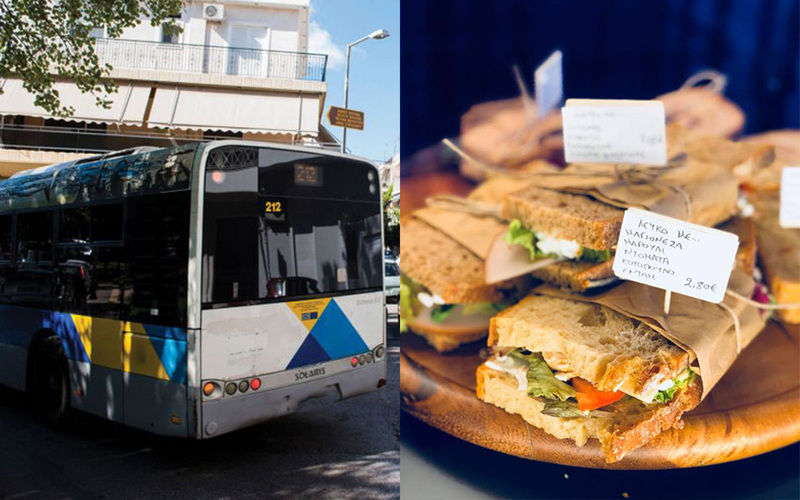 Either by happy chance, or the workings of a gourmand bus planner, this route links up some of the finest out-of-the-way specialty food shops in Athens. Six months ago I received the sad diagnosis: there was nothing they could do. My dependable moped, which I’d relied on for the last 18 years, finally gave up the ghost at the neighborhood repair shop. And so I had to turn to public transport. For me, that meant the 212 – a tiny bus connecting the neighborhoods of Karea and Dafni. But here’s the great part: whoever designed this route must have known what they were doing, or so I like to think, because how else could it be that so many stops offer a new delicious treat? I get on the bus at the “3rd Karea” bus stop. Next to it is a favorite spot: the butcher/taverna Ta Katsikakia (The Kid Goats). 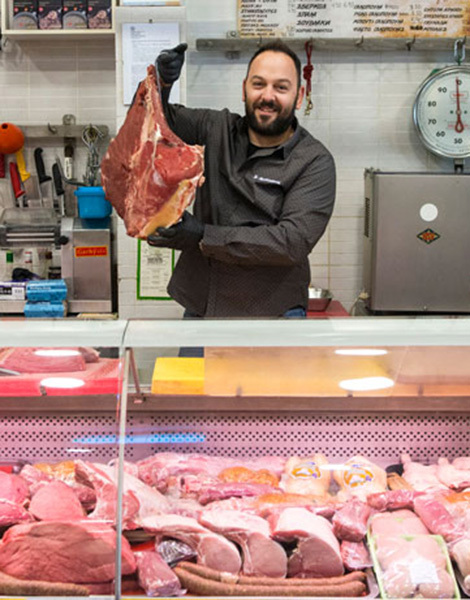 The butcher here, Christos Georgopoulos, is young, knowledgeable and polite. He knows meat. As in, he knows about different cuts before they become trendy, and he has excellent advice to give on how to prepare each of them. Here, I find kid goat from Skyros, veal from Macedonia, pork and poultry from Evia and, generally speaking, meat sourced from good farms. Among the specialties is the beef carpaccio, which Christos marinates with good olive oil, salt, herbs and pepper. During the holidays, he prepares stuffed meat rolls and poultry, traditional pork dishes and suckling pig. From here, bus 212 takes you through the Prosfygika neighborhood of Karea (originally settled by refugees from Asia Minor), and into the streets of the suburb of Vyrona. Get off at “Periptero”; periptero means kiosk, but don’t look for one – it isn’t there anymore. Just in front of the bus stop however, you’ll find the delicatessen Diktamo. Here, siblings Kallia and Giorgos Koumentaki sell products from the island of Crete. Kallia is usually busy in the workspace behind the counter, kneading bread made with flour from Limnos and Domokos. Using the same flour, she bakes some of the best wild greens pies I’ve ever tasted, with a crispy, light and flavor-packed crust that is not too salty (an unusual find), and a delicious filling of spinach, chervil, Mediterranean hartwort and quality cheese. Or she’s bent over pots, making sauce with Vravrona tomatoes. Put it on a pizza, and you’ll thank me. You’ll also find nice cheeses and charcuterie, and a large variety of rusks. From Diktamo, head straight to cheesemaker Karyas next door. 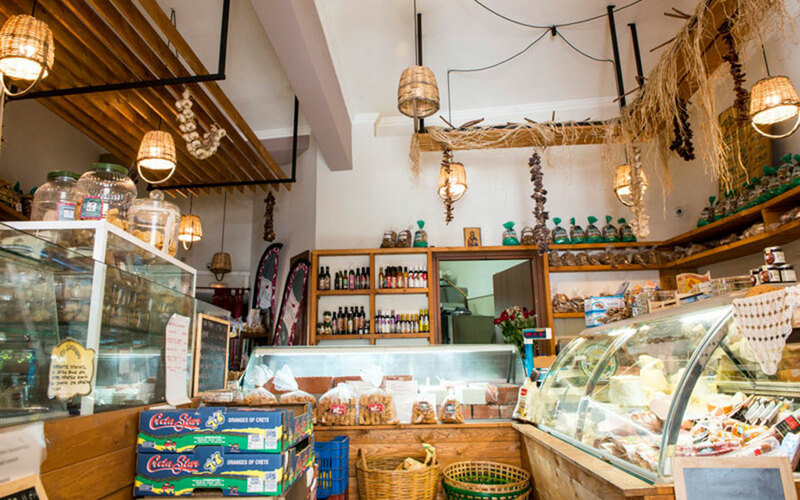 This hole-in-the-wall sells traditional yogurt and cheeses such as graviera, anthotiro, and myzithra – all made from sheep’s milk, full of rich, old-school flavor. Everything is made by the four sons of the cheesemaker Theodosis Mavrogiannis, from Karya in Argolida in the Peloponnese, who founded the business. You’ll find great feta cheese, the most popular being the soft one, which is buttery, peppery, and just slightly bitter – and incredible on a slice of warm, country-style bread. The sheep’s milk graviera is equally delicious, with flavor that changes with every bite, both sweet and bold. The 212 arrives. I board and ride on to “Gymnastiki Akadimia“. This stop is right by The Crust Factory. Look for their symbol: a rolling pin. The style is industrial inside and out. To the left is the workshop, where the sweets are made, and at the back, there’s paradise on earth: pies of every kind. Made with ingredients like graviera cheese from Crete and Naxos, chicken, and Italian prosciutto and parmesan, they are baked fresh every day, each with a crisp and delicious crust. The coffee is good too. There are two machines and two mills, so one never gets overworked. From here, the bus stops at the Daphni metro, and then heads back towards Karea. I get off again at “Agora” in Vyronas. 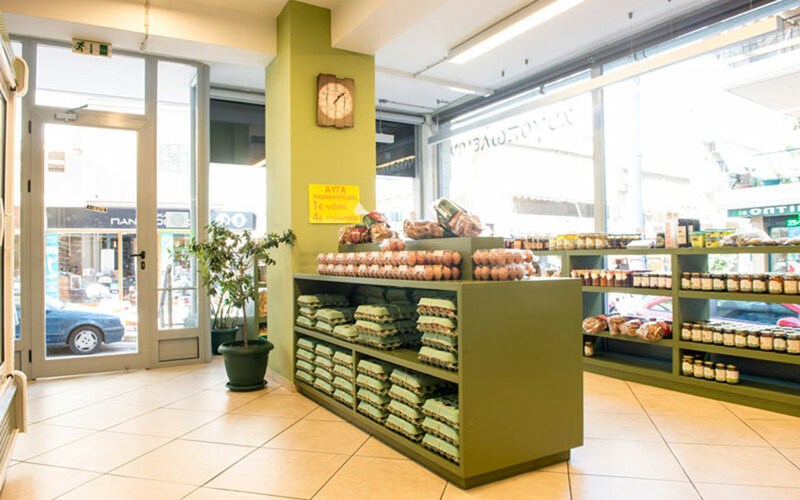 Here, Christos Chatzelis’ Avgopoleion (literally meaning Egg Shop) sells fantastic eggs from his family’s modern, 30-hectare farm in Pigi, on the island of Lesvos. The eggs arrive from the island almost daily, and the prices are shockingly low: half a dozen eggs cost 1€, and 30 eggs are just 4€. All the other products for sale – oil, cheese, pasta, tahini and ouzo – are also from Lesvos or Limnos, at equally good prices. No wonder the store has a lot of loyal customers. By the time I leave, half the eggs are already gone. Across the street from Avgopoleion is Valmas Nuts, a store that’s been around since 1958. Since 1984, it has been run by Vasilis Kontogiannis, who grew and updated the business. Just selling fresh nuts wasn’t enough for him; he invested in specialty ovens, where he roasts the nuts himself. Each type of nut is roasted just right, to get the perfect crunch and keep all their delicious flavor. 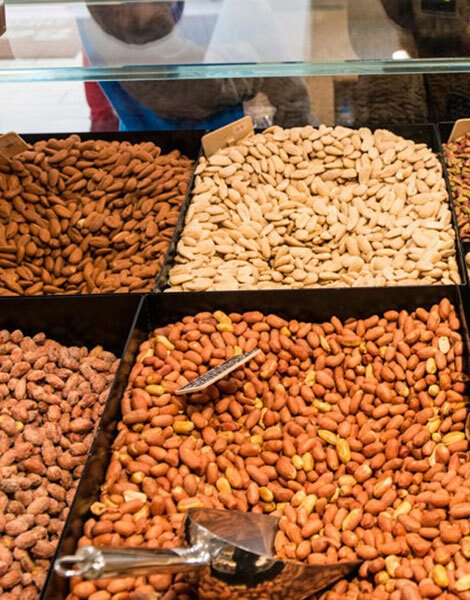 Every Greek nut is represented; there are three types of almonds (the small and flavor-packed ones from Volos stand out), authentic Aegina pistachios, walnuts from the mountains of Corinthia, and peanuts from Kalamata. You can buy them all raw or roasted, and with or without salt. I recommend the perfectly roasted and lightly salted macadamia nuts, and, perfect for enjoying with a drink, the peppered peanuts. There’s also dried fruit (most of it Greek), nut butters made from almond, hazelnut, pistachio, macadamia and walnut; granolas; and over 20 different nut and dried fruit blends. 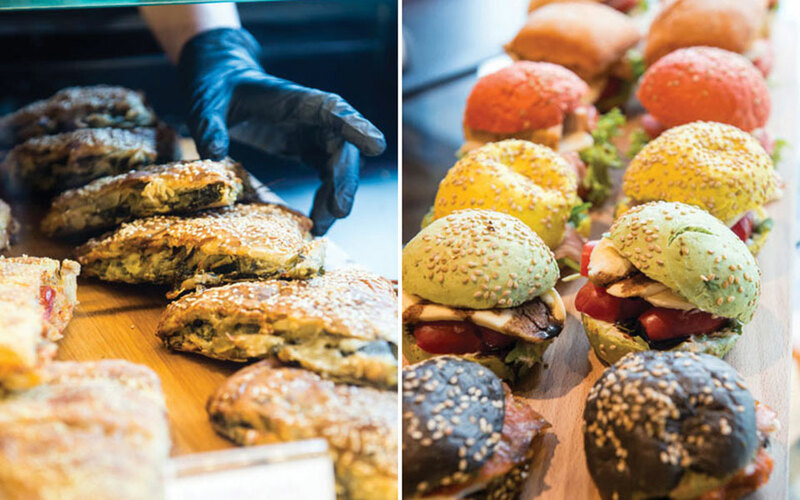 It’s a snack lover’s paradise. The last stop on the route is a filling one. Get off at “Pal. Terma Neas Elvetias”. From the bus windows, I look straight into To Trello Violi (Crazy Violin) creperie, where, on entering, I’m met by the amazing smell of their giant crepes. There’s no secret recipe, just great ingredients, chosen with love. The daily-made batter is tasty – like homemade. 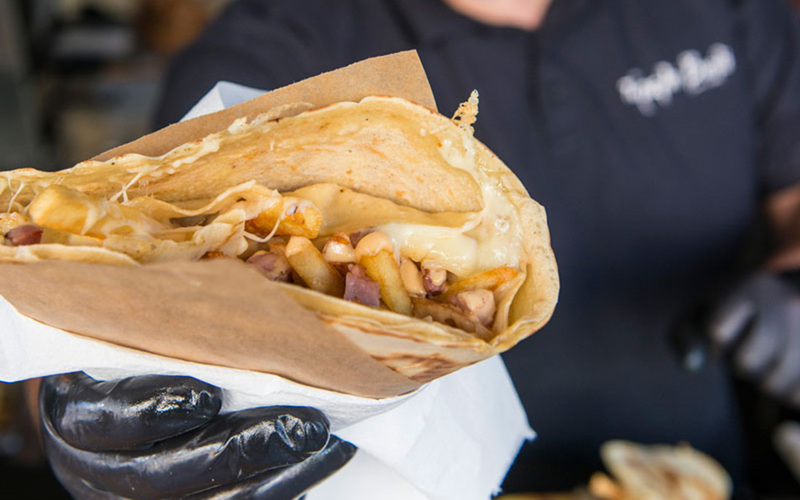 Each crepe is named for the owner’s loved ones. “Martha”, with chicken and bacon, is a popular choice. I recommend the one with charcuterie and kopanisti cheese from Mykonos – an unforgettable combination! This article was originally published in Greek, on gastronomos.gr.